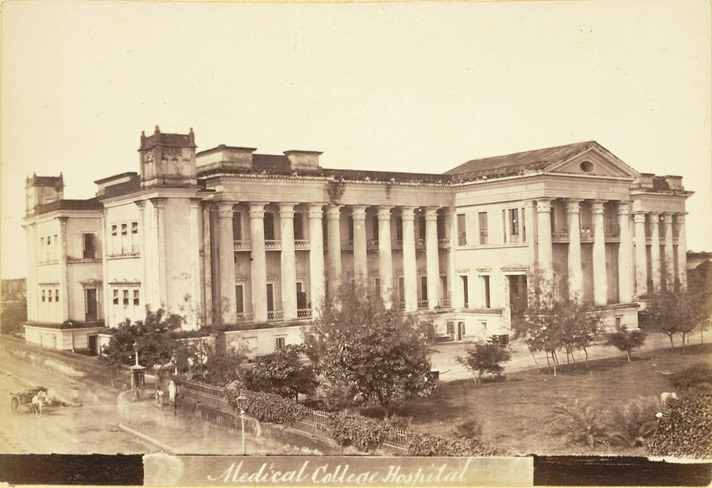 William Brooke O’Shaughnessy’s investigations at a Calcutta hospital into the potential of medical marijuana were the first in modern medicine. The colonial peripheries had no shortage of impressive polymaths, but what sets O’Shaughnessy apart is the manner in which, while conducting research in his many areas of interest, he not only tapped into elaborate local knowledge networks and structures but also rigorously documented them, thoroughly crediting his sources both bibliographic and human. O’Shaughnessy also stands out on account of what was, arguably, his most significant contribution to medicine: the claim that cannabis could be used as a medicinal drug. As an intoxicant cannabis was fairly common in India, as O’Shaughnessy noted, but he demonstrated its potential use in a medical context, particularly as an anaesthetic. The papers on his experiments with the plant were published in the Journal of the Asiatic Society of Bengal in late 1839 — and were also read in front of the Medical and Physical Society of Calcutta in October of that year. In them, we find detailed records of his prescient experiments and a fine example of his unique style of research. O’Shaughnessy then proceeds to try variants of these initial treatments on a number of maladies. He describes the effect on four cases of patients suffering from rheumatism, a case of hydrophobia, on cholera and tetanus, before issuing a warning about the delirium that may be occasioned by inappropriate dosage. Some of the reports wouldn’t be out of place as descriptions of a merry stoner’s night in (minus the video games). One rheumatism sufferer, to whom “half a grain of Hemp resin was given in a little spirit … became talkative and musical, told several stories, and sang songs to a circle of highly delighted auditors, ate the dinner of two persons …, sought also for other luxuries I can scarcely venture to allude to, and finally fell soundly asleep, and so continued till the following morning”. Perhaps not unsurprisingly the next day the patient “begged hard for a repetition of the medicine”. Elsewhere O’Shaughnessy describes a somewhat surreal episode in which a rheumatism patient administered with cannabis enters a state of “catalepsy”, whereupon his rigid limbs could be moved only with the help of medical staff, who could place them in “every imaginable attitude” where they would remain “no matter how contrary to the natural influence of gravity” — all the while the patient remaining completely “insensible”. The commotion of events ended up rousing a second patient, similarly dosed, who became “vastly amused at the statuelike attitudes” he witnessed, and then proceeded, after a sudden “loud peal of laughter” to exclaim that “four spirits were springing with his bed into the air”. After a subsequent “uncontrollable” fit of the giggles this second patient then took up the strange condition of the first, his arms and legs “remain[ing] in any desired position”. Despite the slightly chaotic scenes, within a day or so both patients were much relieved of their rheumatism, and in three days completely cured. Interestingly, it is while recording a failed treatment of hydrophobia that O’Shaughnessy notes one of the fundamental arguments for this medicine: even if it failed at curing the actual root of the illness, “at least one advantage was gained from the use of the remedy — the awful malady was stripped of its horrors”. If the illness was terminal, at least cannabis could enable the physician to “strew the path to the tomb with flowers”. The argument is not unfamiliar today, and indeed, in a prescient echo of more recent advocates of cannabis’ legalisation, O’Shaughnessy also downplays the drug’s supposed negative effects compared to other certain popular legal narcotics. As to the evil sequelae so unanimously dwelt on by all writers, these did not appear to me so numerous, so immediate, or so formidable, as many which may be clearly traced to over-indulgence in other powerful stimulants or narcotics, viz. alcohol, opium, or tobacco. The interest of O’Shaughnessy’s medical students was also clearly piqued. He reports that several ended up experimenting on themselves and describes in detail one particular auto-experiment by a “retiring lad of excellent habits” which, twenty minutes after ingestion, led to the “most amusing effects I ever witnessed”. I found him enacting the part of a Raja giving orders to his courtiers; he could recognize none of his fellow students or acquaintances; all to his mind seemed as altered as his own condition; he spoke of many years having passed since his student’s days; described his teachers and friends with a piquancy which a dramatist would envy; detailed the adventures of an imaginary series of years, his travels, his attainment of wealth and power. He entered on discussions on religious, scientific, and political topics, with astonishing eloquence, and disclosed an extent of knowledge, reading, and a ready apposite wit, which those who knew him best were altogether unprepared for. For three hours and upwards he maintained the character he at first assumed, and with a degree of ease and dignity perfectly becoming his high situation. A scene more interesting it would be difficult to imagine. It terminated nearly as rapidly as it commenced, and no headache, sickness, or other unpleasant symptom followed the innocent excess. In and amongst these colourful accounts, O’Shaughnessy’s paper is peppered with references to other instances in which his fellow medical men had employed the administration of cannabis to alleviate patients’ symptoms. 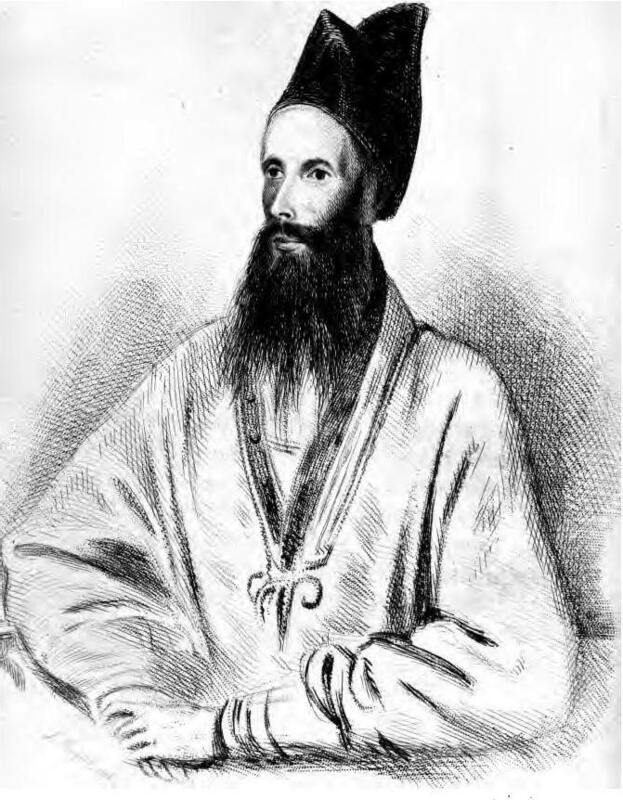 The list includes his cousin Richard O’Shaughnessy, Dr Bain of the Police Hospital, Mr O’Brien of the Native Medical Hospital, and not least, James Esdaile (another Edinburgh student, best known for his experiments with mesmerism at the Hooghly Imambarah College, which he recorded in his 1851 book Mesmerism in India). The historian Shrimoy Roy Chaudhury feels that it was the “conquest of pain in surgery” that granted British medicine historical credibility in India. Hemp played a key role in this. And veterinary science got involved as well — among notable experimenters in this field being the firm Hughes and Templar, who claimed to have cured three out of “five cases of horses suffering from tetanus” with the hemp resin. Before setting out the details of his experiments, O’Shaughnessy offers a background to the drug in four sections: its botanical character, popular uses, historical details, and medicinal properties. But he does all this with a little help from his friends: some regular and some, as that other great “generalist” Sherlock Holmes would call them, irregular. The network, as the following series of annotations to O’Shaughnessy’s article will demonstrate, is an incredibly wide and diverse one. For the historical and statistical data he thanks the following: “the distinguished traveller the Syed Keramut Ali, Mootawulee [guardian] of the Hooghly Imambarrah”, “Hakim Mirza Abdul Razes of Teheran”, Pandit Madhusudan Gupta, “the celebrated Kamalakantha Vidyalanka [sic], the Pandit of the Asiatic Society”, and Mr DaCosta. Syed Keramut Ali, former Great Game “Newswriter” under Arthur Conolly in Kandahar, helped O’Shaughnessy with Persian references and a few manuscripts. Additional translation help may have also come from “Mr Da Costa”, which is presumably Lewis Da Costa, a polyglot and a prolific translator serving as Assistant Persian Translator to the Government of India in the 1840s. O’Shaughnessy wished also to appeal to Hindu authorities and the most obvious names listed in this regard are Madhusudan Gupta – celebrated as the first Indian to dissect a cadaver (though recent histories have justifiably questioned this claim) – and Kamalakantha Vidyalanka, who was appointed teacher of Rhetoric at the Sanksrit College and became part of the British judicial system as a pundit. Vidyalanka appears to have had no direct link with medicine but provides O’Shaughnessy with a number of obscure Sanskrit references to the use of hemp, including a prohibition for Brahmins in particular found in the texts of Manu. While reaching out to his scholarly friends on the one hand, O’Shaughnessy also sought advice from the Deputy Superintendent of Police, Mr McCann, on official surveys regarding the consumption of “gunjah”. But if he wanted to know about the daily lives of his consumers, he needed someone “irregular”. 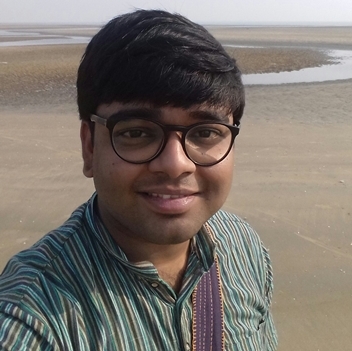 For such purposes he tapped into the experience of one Ameer, “the proprietor of a celebrated place of resort for Hemp devotees in Calcutta, and who is considered the best artist in his profession.” For understandable reasons, that is all we ever learn regarding the identity of Ameer. It is perhaps thanks to Ameer, that O’Shaughnessy’s report is so able to display an exceptionally close knowledge of the uses of the various extracts. While Sidhee, Subjee and Bang (“used with water as a drink”) is “chiefly used by the Mahomedans of the better classes”, Sidhee (“ground, mixed with black pepper, and a quart of cold water”) is the “favourite beverage of the Hindus who practice this vice”. Gunjah, on the other hand, is “used for smoking alone”, and one rupee weight mixed with dried tobacco, “suffices for three persons”, although you find “four or five persons usually join in the debauch”. The demography is curious, especially in the case of Majoon, (a hemp confection which is “a compound of sugar, butter, flour, milk, and Sidhee or Bang”) which is consumed by all classes, “including the lower Portuguese or ‘Kala Feringhees,’ and especially their females”. For interested parties let it be known, O’Shaughnessy has provided ample details to try out your own nineteenth-century recipes. He distinguishes between each type of extract and offers specific descriptions of how they are prepared, although the one which he recommends in greatest detail is meant for medicinal use only. 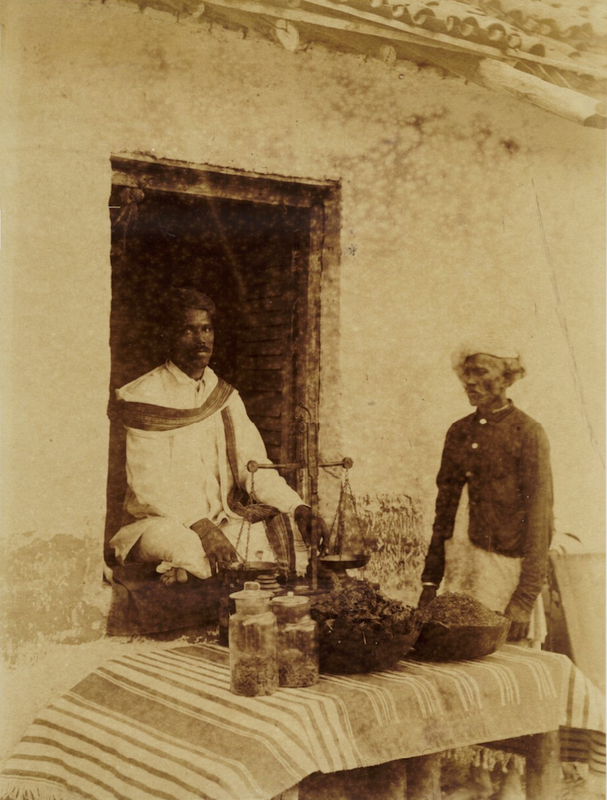 Inadvertently he also maps availability of the finest quality of each kind — sourcing his churrus as he did from Nepal, thanks to Dr. A. Campbell of the Bengal Medical Service, a man with the dubious distinction of changing the course of Darjeeling’s history when as Superintendent he oversaw a huge population rise between 1839 and 1849. The first part of the article also offers a rare glimpse into the contemporary consumption habits — an account that differs in tone and content from the usual official surveys. If we discard the binary model often used to understand the exchange of knowledge (scientific, legal, or otherwise) between the colonial centres and peripheries, and turn to the idea of networks (as the historian Kapil Raj, for instance, has done), we realize that the networks that produce knowledge are much more complex than they appear at first glance. In W. B. O’Shaughnessy we have someone who is rigorous in noting down all the different sources of information that he taps into, and we realize that, upon closer inspection, even the nodes of a network give way to many other interconnected webs. 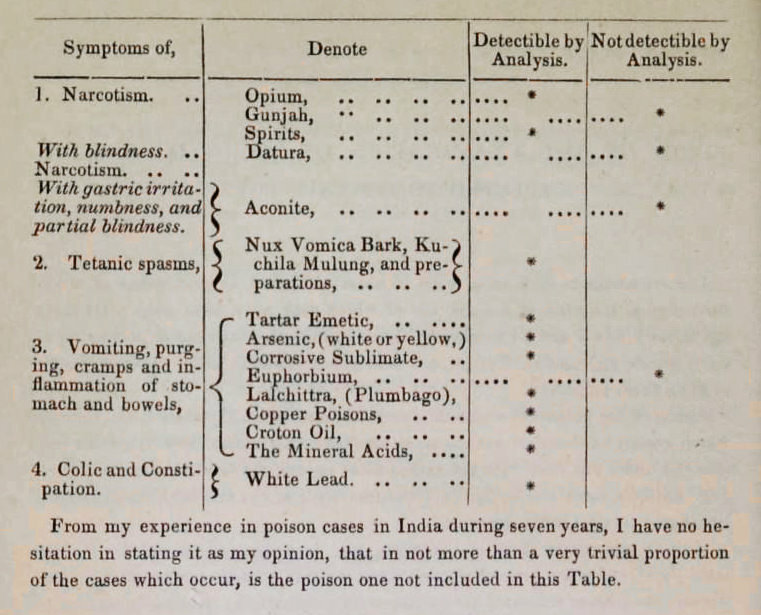 In the thirty-one-page Report on the Investigation of Cases of Real and Supposed Poisoning (1841), found in the National Library of India (Kolkata), we see our doctor sitting in the centre of another web of intrigue. After a call out, people sent O’Shaughnessy items ranging from “the remains of a chapattee, which is said to have been the cause of death of Dasi Bania” to “a stomach…and the small intestines with the contents thereof, all stated to have been removed from the body of a man” found dead in the Native Hospital. O’Shaughnessy, who was Chemical Examiner to the Government, received mails from persons in different posts in the British government from all over Bengal. He would send back his reports with details of his chemical analysis, opining whether there may have been foul play. He often struggled with forms of poison (often with the common bish which is available at any Calcutta market) that were not yet recognized by Western medicine. Table from O’Shaughnessy’s Report On The Investigation Of Cases Of Real And Supposed Poisoning (1841). Credit: Report on the investigation of cases of real and supposed poisoning. These are by far the most interesting cases which I have ever met with. The respectability of the individuals implicated; the extraordinary period which elapsed during which the bodies were exposed, without coffins, to the destroying influences of the heat and rains of Bengal; the curious changes which the poison underwent…constitute an array of circumstances scarcely surpassed in medico-legal interest by any but those of the celebrated Laffarge trial. This was not his first encounter with the science of criminal activity. In 1830, a young O’Shaughnessy arrived in London, struggling to find permanent employment. Soon after, urged by the editor of The Lancet, he published an article on “Poisoned Confectionary”, the result of an extensive study. Along with a Dr. Green, he purchased “at several shops, different specimens of coloured confectionary, and of colourless articles wrapped in stained paper.” Each colour was analyzed rigorously. The yellow, for instance, was understood to be a result of adulterating the candies with either “gamboges, massicot, Naples yellow, the chromate of lead, or vegetable lakes.” A report on the study was published in an 1831 issue of The Medico-chirurgical Review and Journal of Practical Medicine, in which the writer remarks: “Dr. 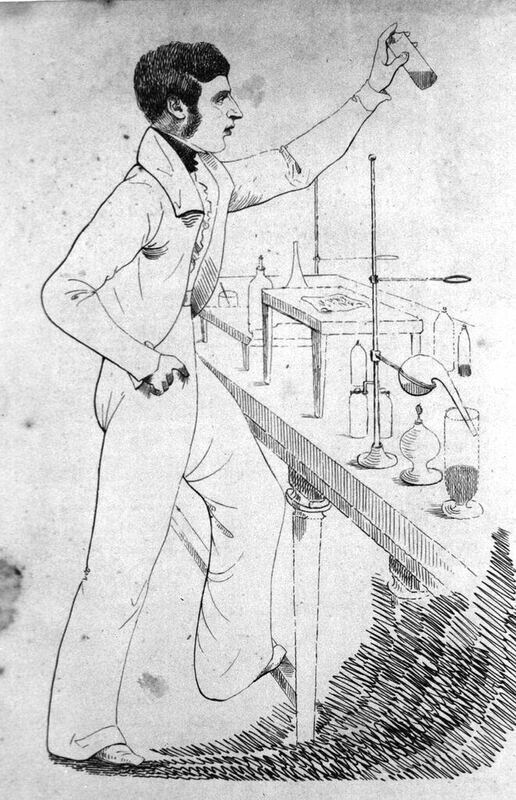 O’Shaughnessy is evidently a clever chemist, and his industry appears equal to his talent in the department of human knowledge”. The Journal of the Asiatic Society of Bengal published in the span of a few months two other experiments performed by O’Shaughnessy. In 1839 he reports on his use of the Galvanic battery for the “successful destruction of the wreck of the Equitable at Fultah Reach”, where the Sydney-bound ship “leaden with wheat, rice, rum, &c.,” had touched on the sand below and turned over “in six to seven fathoms of water”. The first one, however, anticipates his later work on telegraphy — a form of communication that would be taken seriously only after 1847, with Lord Dalhousie’s appointment as governor general. 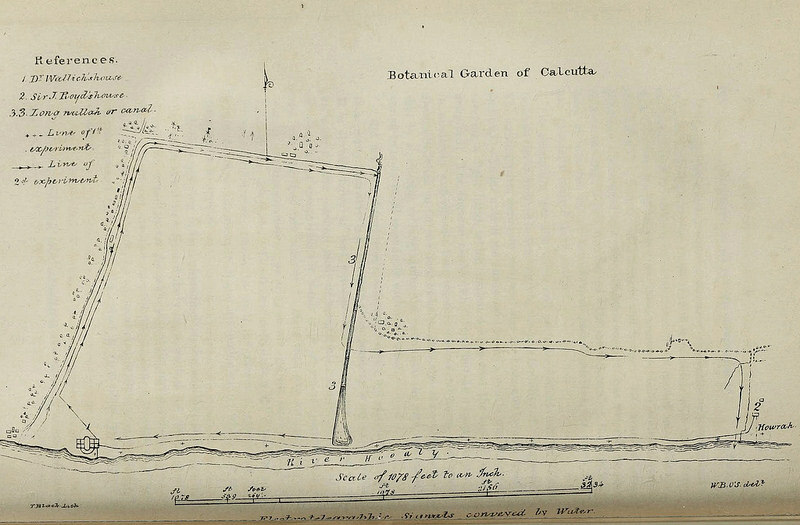 At the Botanical Gardens in Shibpur (he already had cordial relations with the persons in charge, such as Nathaniel Wallich), he experimented with the first telegraph circuit. After laying the cables, the two ends starting and ending where he positioned himself, he used to a pair of modified watches “of the cheapest kind”. (This is before his visit to England where he learnt of the Morse.) “Round the second hand was placed a card dial laid off with three concentric circles divided each into twenty parts.” He omitted “vowels and superfluous letters” (reminiscent of today’s SMS truncations), and using this he successfully sent across messages. Each signal took about three minutes to transmit, and both watches were “then allowed to run to No. 1 or zero, and stopped”. 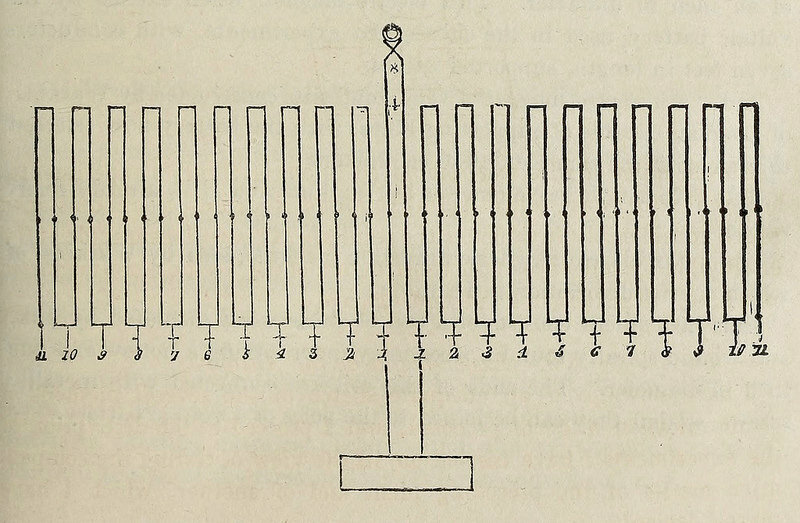 Diagram of the telegraph system, featured in O’Shaughnessy’s “Memoranda relative to experiments on the communication of Telegraphic Signals by induced electricity”. Credit: Journal Of The Asiatic Society Of Bengal (1839). It is in his work on the telegraph system – and particularly his role in rebuilding it after it was largely destroyed in the Indian Rebellion of 1857 – that we can see more clearly the dubious nexus between such scientific projects and the endeavours of colonialism, a connection made more explicit at moments of political crisis. As far as O’Shaughnessy’s contribution to medicine is concerned, its correlation with colonial power is perhaps not as obvious. Yet it does contribute, even if unintentionally to the larger discourse of knowledge/power, relating to what Shiv Visvanathan and Ashis Nandy call the “industrial grid”. Western medicine, through sheer claim of objectivity, marginalised, traditional, and subsequently, “folk medicine”, while at the same time deriving its legitimacy on foreign soil from references to indigenous texts and social practices, through Sanskrit and Perso-Arabic scholars and local practitioners. In this regard O’Shaughnessy was no exception. Rather than thinking only of centres (individual or institutional) of knowledge production in the colonies, we’d do better than to focus more on the complexity of networks and exchanges – the go-betweens, as Kapil Raj calls them – who played such a key role in the production of the colonial sciences. It is here, in light of such an approach, that the detailed notes left behind by William Brooke O’Shaughnessy prove so invaluable, offering a rare and honest glimpse into how such networks functioned. This article was originally published in The Public Domain Review and has been republished under a Creative Commons BY-SA 3.0 license.